Nat King Cole first crooned about the joys of cruising along the Interstate back in the 1940s; “(Get Your Kicks On) Route 66” evokes a range of universally appreciated art featuring the ubiquitous American highway. Like many others growing up in Sri Lanka, I would sing along without quite understanding the euphoria that Cole was describing. After all, Sri Lanka had no equivalent high-speed, access-controlled toll roads until late 2011. 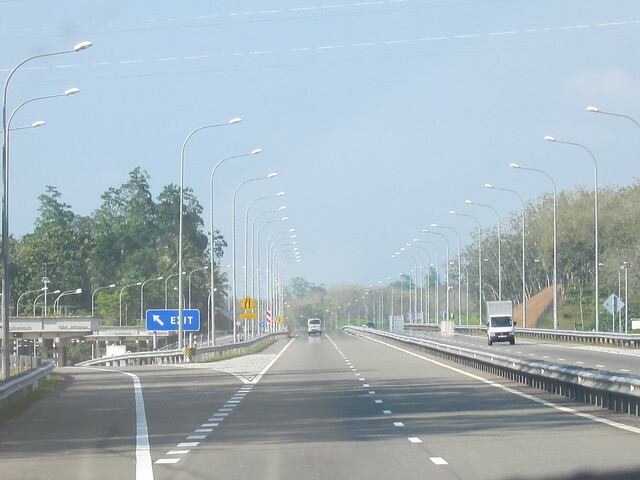 It is difficult to describe, to an audience for whom the highway is a part of daily life, the excitement in Sri Lanka when the Southern Expressway (E01) was constructed two years ago. It was nothing short of a spectacle. Those who were given access to “tour” the road before it officially opened on November 27th 2011 immediately posted videos on YouTube. When the E01 opened, the atmosphere was carnival-esque. 6,000 vehicles travelled the highway in the first 18 hours, generating a toll income of 1.5 million rupees (approximately US$13,225), while an estimated 8,000 cars travel the length of the Southern Expressway each day. 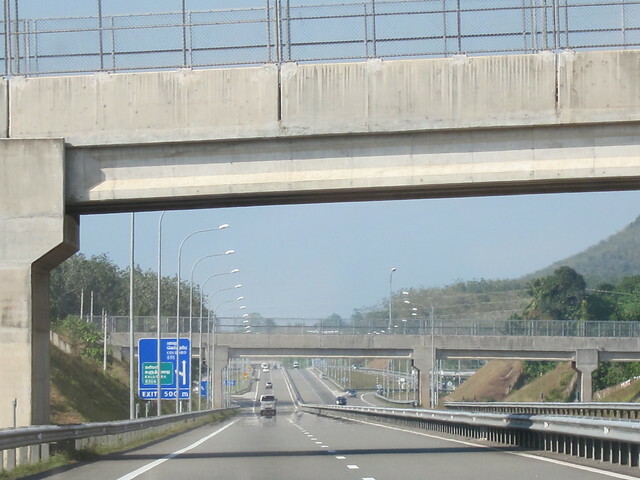 The E01 is the first of a planned network of expressways designed to link major cities in the island. It currently connects the western capital of Colombo with the southern city of Galle. 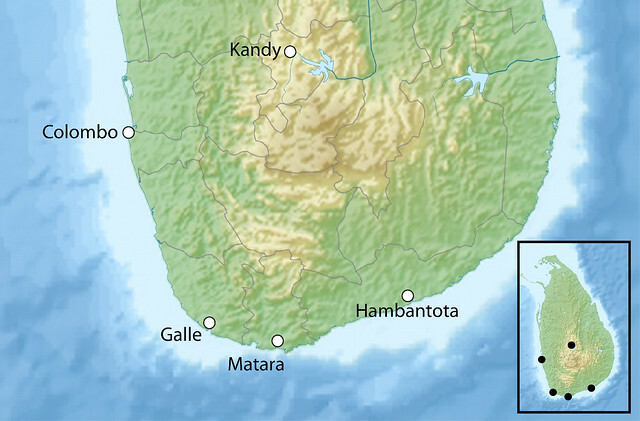 When the 128km road (~80 miles) is completed, it will stretch to Matara, located at the southernmost tip of the island. 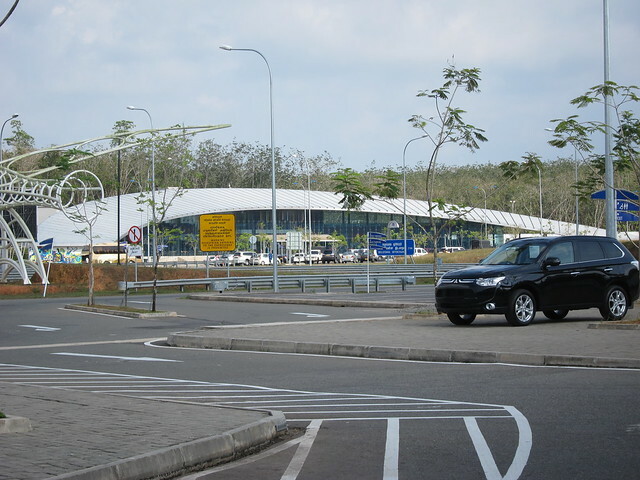 There are proposals in the works to extend the road to the port city of Hambantota, which will be a boon to those travelling to and from the recently completed Mattala International Airport in the area. The expressway replaces the A2 high road, which is colloquially known as the Galle Road, as the major connector to the south. The drive along the Galle Road from Colombo to Galle is actually slightly shorter in length at approximately 120km (~75 miles). You wouldn’t know this when travelling, of course. While the speed limit on the Galle Road is 70kmph (~45mph), with 50kmph in towns, actual speeds are much slower (think 18-25mph) during most hours of the day owing to congestion. The beauty of the access-controlled E01, for Sri Lankans, at least, is that it enables them to drive, for the first time, at steady speeds of 80-110 kmph (50-60 mph) – no more rush hour or school traffic to contend with. An added bonus is the fact that the E01 is a particularly picturesque expressway, flanked by rice paddies and plantations of coconut and rubber. And yet, a cursory glance at the numbers demonstrates that data alone can’t capture what the highway signifies in Sri Lanka. After all, what are 8000 vehicles a day to an American, or a highway that is still only 80 miles long? But not only is the E01 a start of something new (and beginnings are always exciting) it signals a change in mindset. Perhaps the real excitement is that Sri Lankans can appreciate, for the first time, how small their island nation is. 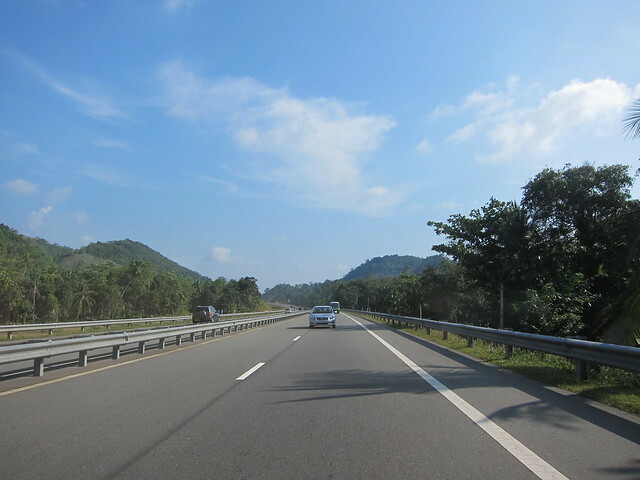 Getting to the south via the Galle Road would take up to four hours; on the E01, the journey is roughly one and a half hours, despite the bottlenecks caused by exits that spill into narrow and winding roads that are still in the process of being developed. Shahera Omar, a young professional, noted that the highway changed her concept of time and distance. “Normally, when you travel around Sri Lanka, the travel itself is such a big deal. In other countries, you talk in terms of distance; in Sri Lanka you usually talk in terms of time, but now that’s changing.” Sri Lanka is geographically roughly the size of West Virginia (that’s three times as big as Massachusetts), and yet before the E01, this would have been a meaningless metric when trying to estimate the time it took to get around Sri Lanka. The new expressway has shrunk Sri Lanka from a seemingly sprawling landmass into the island it really is. Evoking the elation of the quintessential road trip song, Ms Omar’s mother, Khairy Omar, described her first journey along the E01 in almost poetic terms. “Going on the highway in my own country – what a treat. I imagine it must be like someone who’s come from the middle of the country, who has never seen the sea before.” Ms Omar agreed. “I felt proud,” she said, although noting that it simultaneously felt a little absurd to feel such pride in the construction of a road. And yet, Sri Lankans have associated highways with “developed countries” for so long that the E01 seems to be more than just a new motorway. Perhaps the E01 is a source of pride not only because it enables Sri Lankans to fly like birds from coast to coast, but also because of what it symbolises to them. The thirty-year Sri Lankan Civil War, which ended in 2009, is still fresh in the minds of the island’s inhabitants. To many, the surge of infrastructural development projects – including the E01 – is a sign of reconstruction and rebuilding. Amidst efforts to reconcile, the expressway physicalises the act of connecting people and bringing them closer to one another. Shaped like a bulging teardrop, Sri Lanka spans a length of only about 270 miles from north to south. Limited access to the north during most of the conflict, however, meant that many Sri Lankans have never made that journey. The completed highway network can make that journey a reality, and perhaps being able to “see things for oneself” may help to shatter a few stereotypes. It is, of course, optimistic to place one’s hope in a highway as a catalyst for peace, but it is clear that the E01 is a symbol with the potential to connect a fragmented nation, promising a journey that extends beyond a mere commute or road trip. There is an array of new services and amenities available to users of the highway, which have met with mixed reactions. As a regular user of the highway, Ms Saleeth was thankful for many of the services that have been implemented. “Most of the time, I use the Expressway Buses. There are two types of buses; in our words we call them ‘big buses’ and ‘red buses’. Big buses are the super luxury [private] coaches and the journey is very comfortable. The red buses are SLTB [state] buses.” She said that while the red buses were also supposed to be luxury vehicles, the ride was much more uncomfortable and tiring. “The only thing I hate about E01,” she said, referring to the exit closest to Colombo, “is the traffic on Highlevel Road. Traffic in Kottawa is crazy. Sometimes we spend 20-30 minutes stuck in this traffic, which reduces the value addition of the Expressway.” She is not the only one to have noticed that the poor conditions and congestion on the roads connecting to the exits, but construction is currently taking place in these areas to ensure a smoother journey. Ms Omar and Ms Saleeth were both sceptical about the usefulness of Canowin Arcade, the rest stop available about three quarters of the way down to Galle. Ms Saleeth confessed, “Even when I travel in private vehicles I don’t use [the service area]. In my opinion it is a fail, because the whole journey is just one hour.” The fact that the same services were available on either side seemed a waste of resources to Ms Omar, who wondered if it were possible to have incorporated some kind of overhead access instead. 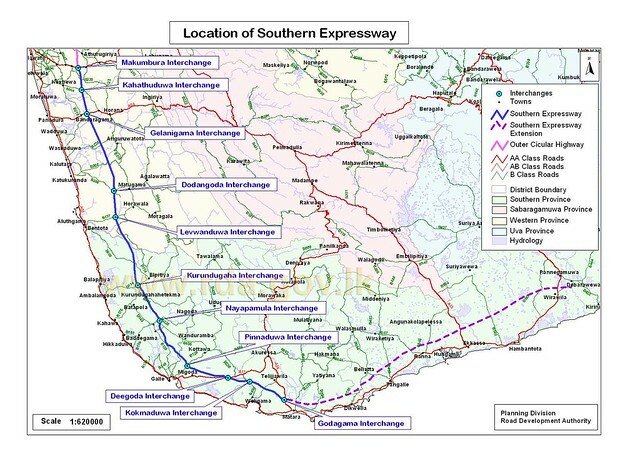 However, it is important to note that the E01 is only the first of a series of interconnected roads, and the rest stop will likely be better utilised when future highways are completed. For now, it is most useful for those who get an attack of the munchies, or for parents of young children who mysteriously need to use the bathroom as soon as they exit the house. The E01 has generated a great deal of public discussion (especially on the internet), with everyone offering opinions on everything from the journey to the construction of the road. Not everyone is complimentary, but that is to be expected. 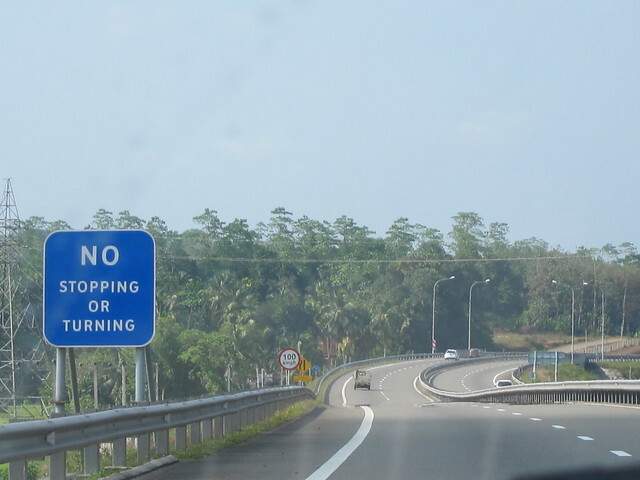 Ms Kadirgamar expressed her concern that there is no real emergency lane, while early travellers on the highway feared for the safety of the dogs and low-flying birds that made their way on to the road, including peacocks. One well-known blogger likened his experience of travelling on the highway to a journey through a wormhole. The first few months following the opening of the highway saw an inevitable run of accidents. There are bigger issues at stake, however. Even though the highway may be a symbol of better things to come, there is always a hidden cost to development, and the E01 is no different from other large-scale development projects. There are issues of inequality: several smaller vehicles like three-wheeled taxis and motorbikes are barred from entry, so the E01 is only accessible to the few who have access to a car or van. The toll fees may make even travelling by “big buses” or “red buses” difficult for some. What about the hundreds who lost their homes so that the highway could be built at all? What about the many small businesses (especially eateries) along the Galle Road that have lost business because they catered to a much slower journey? This week’s series takes a look at some of these hidden costs. It does not aim to downplay the progress taking place, but spares a thought for those who have had to make sacrifices in the name of development. In an island relieved to have dispensed with the horrors of war, it is easy to forget that modernity itself can be a traumatic experience. This series is a reminder to act with empathy and compassion, and ensure that the stories of individuals are not swallowed up by the glamour of the grander urban narrative. These stories provide valuable input as to what to do better next time – given that a second expressway has already been built between Colombo and the Katunayake International Airport 20 miles north, there will be a next time. “Evaluating the E01” is a collaboration with the Centre for Poverty Analysis (CEPA) in Sri Lanka, drawing from data collected by CEPA on those displaced by the construction of the highway. The series also features interviews with small-business owners affected by the shift from the Galle Road to the E01, an issue on which no formal study has yet been conducted. Tomorrow’s essay features the stories of those whose homes once stood where the highway now runs.